Detroit has taken a pretty hard hit from the recession, which is why it works so well as a blank slate for architects and designers. I’ve seen a lot of ideas proposed for this area over the last few years, but The Forest, an idea that won first prize in the 2012 Detroit by Design competition, definitely takes the cake. 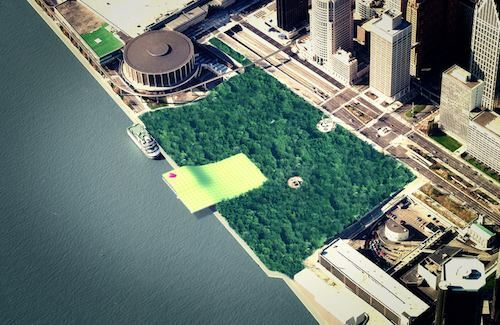 The idea, proposed by designers Hyun Tek Yoon and Soo Bum You of South Korea, and architecture firm atelierWHY, is to take Hart Plaza and turn it into a primeval urban forest. Hart Plaza is a popular downtown landmark on the riverfront that attracts some great events and concerts over the summer, and it wouldn’t hurt to add in some more natural landscapes and vegetation. The idea is to give the park the look of a mysterious natural forest, with the inside full of walkways, bridges, and sculptures. One of the most interesting aspects of this urban forest is the “knoll,” a large structure that would rise like a natural hill and provide views of the city on the open plaza. It would also have a green roof that could be used as seating areas for outdoor events. The interior would have space for a cafe, visitor’s center, and auditorium. I would love to see something like this happen downtown, mostly because I am always in favor of nature intertwining with cityscapes. I can’t see this going over well with city officials, however, because it would involve change and positivity and I’m pretty sure they all hate trees, fairies, and fun. Until then, I can dream. Does this sound cool to you, or a little too crazy for the Motor City?